Rachel Von | The Journal Gazette Mad Ants' Walt Lemon Jr., left, jumps up to shoot the ball as Red Claws' Kadeem Allen looks on during the first quarter of the game at Memorial Coliseum. Rachel Von | The Journal Gazette Mad Ants' Jarrod Uthoff tries to get through Red Claws' Kadeem Allen, left, and teammate Jabari Bird during the first quarter of the game at Memorial Coliseum. Rachel Von | The Journal Gazette Mad Ants' Jarrod Uthoff, right, throws the ball over Red Claws' L.J. Peak to a teammate during the first quarter of the game at Memorial Coliseum. Rachel Von | The Journal Gazette Mad Ants' DeQuan Jones, right, pushes past Red Claws' Kadeem Allen to get to the hoop during the first quarter of the game at Memorial Coliseum. Rachel Von | The Journal Gazette Mad Ants' Jarrod Uthoff, right, tries to push past Red Claws' Kadeem Allen to get to the hoop during the first quarter of the game at Memorial Coliseum. Rachel Von | The Journal Gazette Mad Ants' Walt Lemon Jr., left, tries to find an opening to pass the ball as Red Claws' Devin Williams tries to block him during the first quarter of the game at Memorial Coliseum. 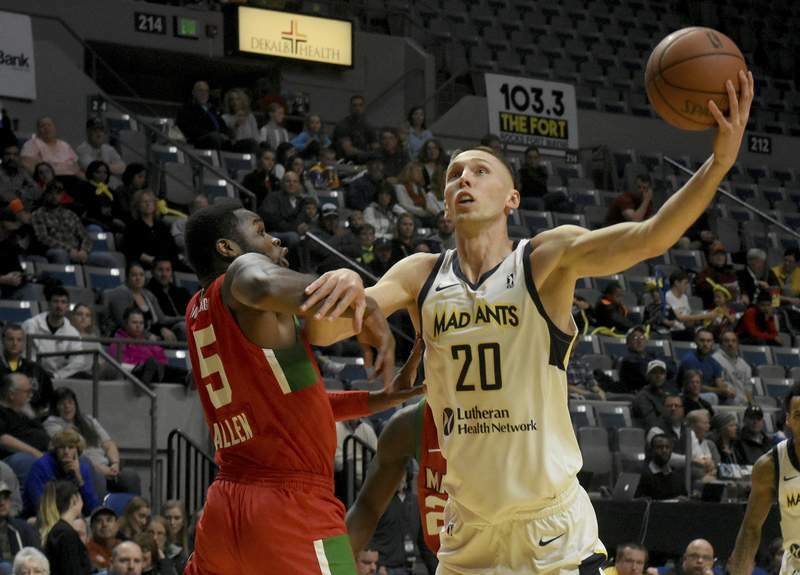 Jarrod Uthoff had 34 points, 16 rebounds and 3 shot blocks – his season-highs in each category – to lead the Mad Ants to a 126-117 victory over the Maine Red Claws tonight at Memorial Coliseum. “I just tried to bring a lot of energy today. Energy and toughness, I tried to focus on that,” Uthoff, a center, said. 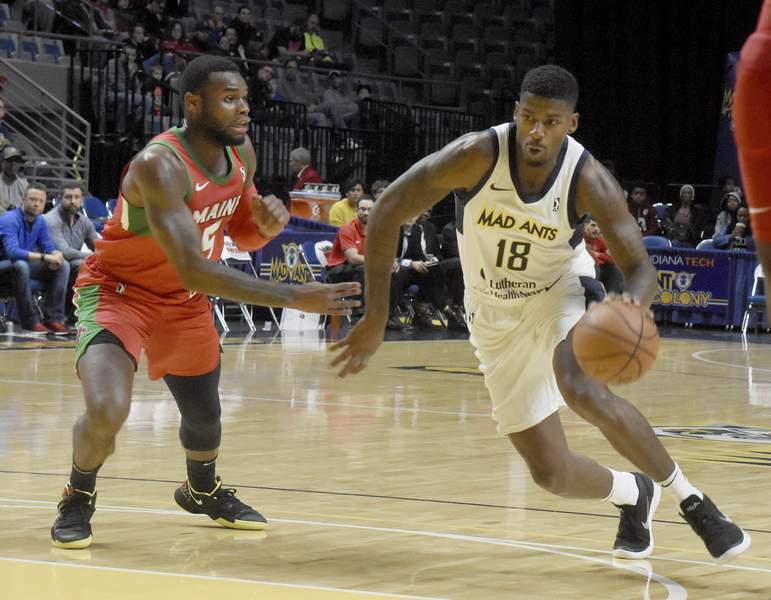 The Mad Ants (6-1) have won six straight games, their longest win streak since they opened last season with six in a row, and they are one of only three 1-loss teams in the G League, along with Wisconsin and South Bay. “That’s why he’s one of the best players in our league. He can play inside and out. He had six offensive rebounds, 16 rebounds, and that’s pretty tough. He’s a big part of our success early on,” coach Steve Gansey said. 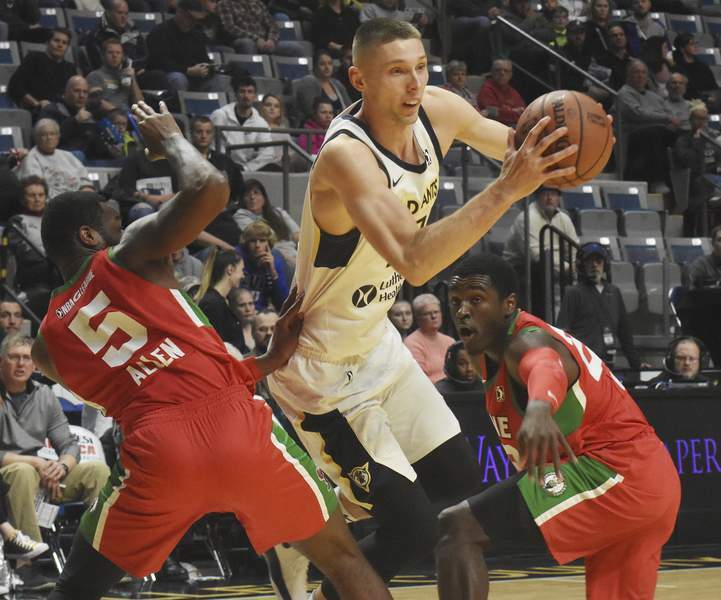 Uthoff agreed that the Mad Ants’ game plan worked out well. Uthoff, who spent time last season with the NBA’s Dallas Mavericks, made 14 of 20 shots as Fort Wayne faced Maine (4-3) for the first time since losing to the Red Claws in the playoffs last season. 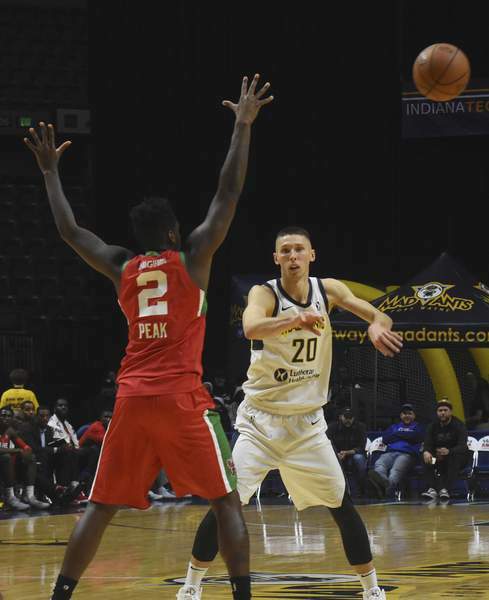 Increased production by Uthoff was needed after center Ike Anigbogu was recalled by the Indiana Pacers following Monday’s 91-78 victory over the Canton Charge at the Coliseum, and Uthoff delivered in front of an announced crowd of 2,141. His previous scoring high this season had been 24 points in a 114-111 victory Nov. 11 over Windy City. 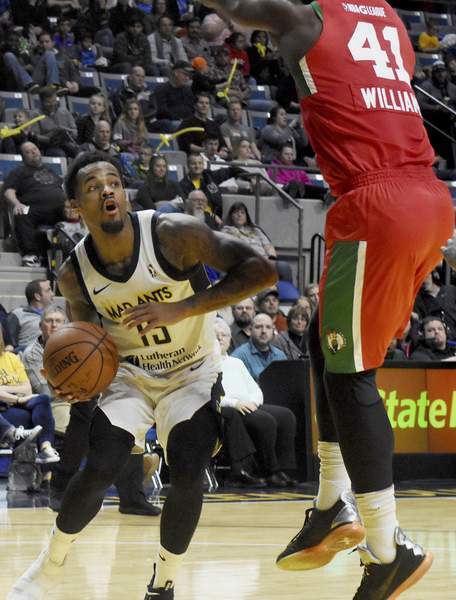 Walt Lemon Jr. had been the only Mad Ants player to eclipse 30 points in a game this season, hitting 34 points twice en route to his average of 25.2 points that was ninth in the G League coming into the game. Lemon had 24 points and nine assists tonight. DeQuan Jones had 23 points. Maine was paced by Trey Davis’ 23 points. Lemon’s sprint the length of the court preceded a pass to Jones for a layup and a 20-14 Mad Ants lead with 3:34 remaining in the first quarter at the Coliseum, where Fort Wayne came into the night with a 4-0 record. Rookie Ben Moore’s arching pass over the defense to Stephan Hicks, who was stationed in the corner, set up a 3-pointer for a 32-24 Fort Wayne lead at the end of the first quarter. 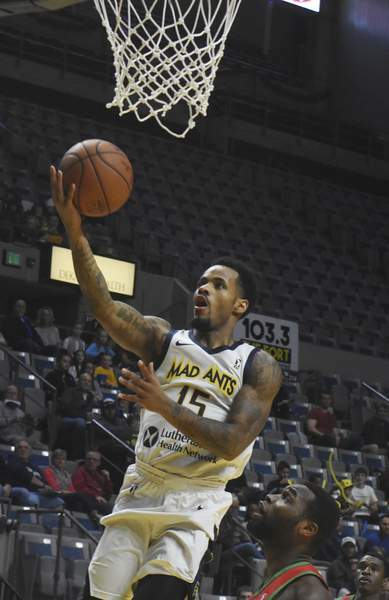 Jones’ thunderous dunk with 5:02 left in the second quarter gave Fort Wayne a 54-42 lead, and Uthoff’s jump shot from just inside the 3-point line with 30 seconds left in the quarter gave the Mad Ants their largest lead of the first half at 65-51. Uthoff made 7 of 9 first-half shots. A Uthoff steal under his own basket set up Jones for a dunk and a hard Kadeem Allen foul, which translated to a 3-point play and an 81-69 lead with 5:17 left in the third quarter. The Mad Ants play host to Northern Arizona at 5 p.m. Sunday.